In one of the most gut-wrenching Husky-Duck football games ever, coach Mario Cristobal saw more evidence his pursuit of a highly physical football team was headed in the right direction as Oregon topped tiring Washington 30-27 in overtime. A jam-packed crowd of over 58,000 was treated to a high-energy contest where no play was inconsequential. To be truthful, the Ducks out-coached the Huskies in several key areas, most notably offensive play selection. The Huskies could seemingly run at will, but at crucial parts of the game in the fourth quarter and overtime, Washington head coach Chris Petersen went to the pass in short yardage situations and on the goal line when a power run outside was the better choice. In the end, it was mighty Oregon that wore down Washington. On CJ Verdell‘s six-yard run on third-and-goal, three Duck offensive linemen pancaked three Husky defensive linemen into the end zone, on their backs. As lineman Shane Lemieux commented after the game, “this was a statement,” running on third down and goal. Cristobal had noticed the Huskies in a pass defense before the play and called time out to change the call. It was an example of the excellent coaching the Ducks are getting from Cristobal and his staff. As it turned out, it was six blockers against four, which were good odds against a team that was sure the Ducks were going to pass. Jalen Jelks (No. 97 above) is being choked by the Husky offensive lineman pass blocking, but he still has enough strength to set the edge of the defense and keep Husky quarterback Jake Browning in the pocket. There are only two receivers downfield and they are covered. Browning, who is an excellent scrambling quarterback, gets frustrated when he is trapped in the pocket without options. He throws an ill-advised pass that is intercepted by (No. 15) Deommodore Lenoir that sets up a 39-yard field goal by Adam Stack for an early 3-0 lead. You must keep Browning contained or he will kill you with scrambling improvisations, both run and pass. Jelks, who is usually well disciplined in maintaining contain on his pass and run responsibilities, gets completely fooled (above) along with several of his teammates, loses contain and Husky running back Salvon Ahmed takes the handoff on an end around play for a 25-yard touchdown. Duck defenders look slow in their reactions and pursuit once the ball is handed off, especially the corner and safety to the side of the run. The speed of Oregon’s secondary is mediocre compared to the top-rated teams in the country. In this video above, the Duck pass offense shows excellent execution as two inside receivers run their defenders off to clear the way for Dillon Mitchell. The receiver on the left runs behind the referee and the defender to avoid a collision. The defender covering Mitchell is forced to run behind all this, giving Mitchell a lot of room to catch the ball and turn towards the end zone. Mitchell shows off some good dance moves that mitigate the Husky defenders who are trying to corral him. Mitchell’s score makes it 10-10 going into the second quarter. Rules state that it is up to defenders to avoid contact with receivers running pass patterns. The Huskies did a good job capitalizing on the Ducks’ defense over-reacting to what they think they see. As last year, Washington has a double reverse (this time a pass above) by Browning that perfectly hits the hands of his tight end down the right sideline for a 33-yard gain that sets up a touchdown making the score 17-10, UW. The coverage by linebacker Kaulana Apelu is correct, but the lack of speed and size compared to the receiver that Apelu is covering makes this a mismatch. The Huskies’ offensive coaching staff unveiled several match-up plays that worked to their advantage. In this case the Duck defenders were overreacting and not watching with their eyes in a manner to see what was actually happening after their initial observation and reaction to the play. Husky defensive coaches anticipated the Ducks attempting to pass on this crucial down. For most teams, third-and-goal from the six-yard line could be considered a passing down, but Cristobal and offensive coordinator Marcus Arroyo show their confidence in their offensive line and running back Verdell (above). According to Lemieux, offensive guard, the play called was Inside Zone and it made a huge statement to both the Husky defense and the rest of the football world — the Ducks don’t need to get fancy, just pound the rock and dance in the end zone. Tight end Jacob Breeland (No. 27) made the best block of his career turning his defender out, away from the running lane and right tackle Brady Aiello (No. 66) drove his defender on his back into the end zone. That is what a “pancake” block looks like. There was at least one more on the left side of the line. 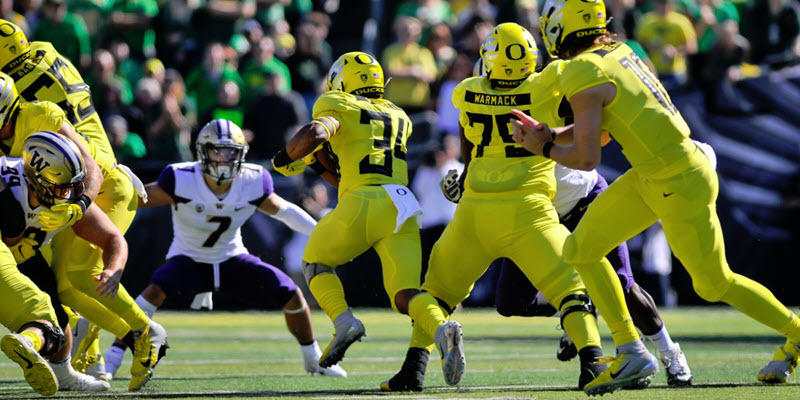 The Ducks had a mismatch on the line of scrimmage, six-to-four as Washington anticipated a Justin Herbert pass attempt. WR Mitchell goes to the left in motion and two Huskies leave the middle and go with him; for the Ducks, an excellent trade off. It’s always a very satisfying thrill to beat Washington, especially at their own game: power football. Cristobal’s young team showed once again they can do this, and they did it against the best defense in the Pac-12. Now they get their mittens and head up to the Palouse and what should be an entertaining match-up with their cousins, the Washington State Cougars. The Ducks have lost three in a row to the pass-happy Cougars and that’s two too many. 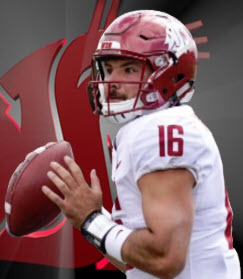 The Cougs are led by a quarterback, Gardner Minshew, who is even more scary wandering outside the pocket than Browning was. This will be a good game to take seriously to the last second as this WSU offense is most likely the most difficult to hold under 28 points in the conference. The Duck defense will need to keep contain and score some sacks. If they can’t get to Minshew, it could be a disaster. Stay tuned.